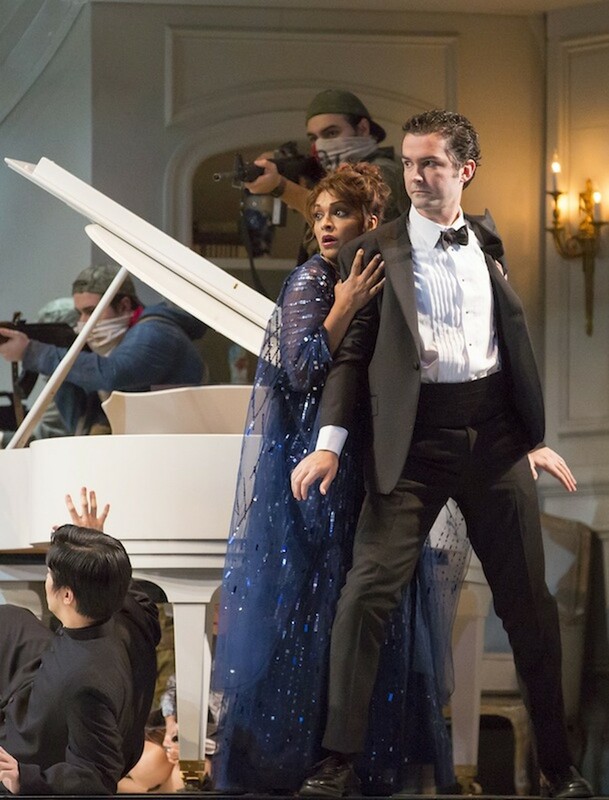 Danielle de Niese (Roxane Coss) and John Irvin (Christopf) survive a hostage crisis in Lopez’s Bel Canto. Freud’s words helped set the tone for the violent plot of Bel Canto. The opera takes place in Lima, Peru, and portrays a terrorist attack on the Peruvian vice president’s mansion during a diplomatic event. The terrorists—who strive to uplift the poor and forgotten—hold the guests hostage, including the famous American soprano Roxane Coss. Her singing ultimately catalyzes unlikely friendships and romances among the hostages—apparently to remind audiences of the therapeutic and unifying power of music. Based on the novel by Ann Patchett and curated by star American soprano Renée Fleming, the opera just concluded its world-premiere run in Chicago. Though it succeeded in making an impression on audiences with its tragic finale, the performance itself was less than impressive. Soprano Danielle de Niese supplied some of the weakest vocals of the evening as prima donna Roxane—ironic, considering her entire character is defined by her magical, powerful voice. De Niese’s opening aria was a bit jarring: I was expecting it to be stunning, but instead I found it weak and shockingly subpar. Luckily, she improved by the end of the first act. But when it came time for Roxane’s aria in the finale—a swooping, melodramatic ode to those lost in the hostage crisis—I was once again left unmoved. How sad that a role with so much potential for a soprano to truly shine ended up being so lackluster. The strongest voices of the evening came from smaller roles, such as the parts of Carmen, sung by mezzo-soprano J’nai Bridges, Gen Watanabe, sung by tenor Andrew Stenson, and Cesar, sung by the brilliant countertenor Anthony Roth Costanzo. Cesar’s role was minor, but Costanzo stole the show with one aria. He sang it humbly, but with genuine nuance and feeling. It was the moment of the evening when I sensed the most unity between singers and orchestra. The score, written by Jimmy López with a libretto by Nilo Cruz, was wonderful orchestral work. Though it featured the dissonance so common to contemporary music, I found it palatable, interesting, and filled with a clear understanding of the orchestra’s timbre and technical capabilities. The brass section was not at all fazed by López’s insistence on making the trumpets play in a range more suited to woodwinds, resulting in a magical intensity. That being said, I was disappointed by the utter disconnect between the orchestral and vocal melodies. For a score so diverse melodically, I was hoping for some sort of vocal reciprocation. Instead, I found many of the vocal melodies to be largely similar throughout. Perhaps this was meant to represent the monotony of hostage life, but I was not sold. The opera featured a number of languages, jumping between English, Spanish, and Japanese, among others. The artistic manipulation of language made Bel Canto a smart, unique listening experience. Such artistic direction took the plotline to a new level of sophistication: rather than telling the audience that some of the characters were from Japan, audience members could hear it for themselves and collectively experience the frustration different characters felt about their language barriers. Cue Roxane’s powerful (or supposedly powerful) voice: though it sounds cliché, Bel Canto embodied the notion of “music as the universal language.” The opera exemplified music’s ability to heal conflict and foster human empathy, emphasizing that in times of enmity we must recall our shared humanity. Despite its weaknesses, the plot of Bel Canto was thought-provoking and poignant. Sure, some of the melodies sounded pretty much the same, while others more closely resembled melodramatic Broadway ballads. But Bel Canto also gave us moments of much-needed comedic relief from Roxane (who was in every way the classic obnoxious American) and, at its conclusion, catharsis—the tragic deaths of many of the characters fully conveyed the horror of terror in our world. Ultimately, with tragedies plastered on daily headlines worldwide, I was willing to overlook some of Bel Canto’s inconsistencies and feel grateful for its constant reminder to audiences that, despite our ideological and cultural differences, we are all human.